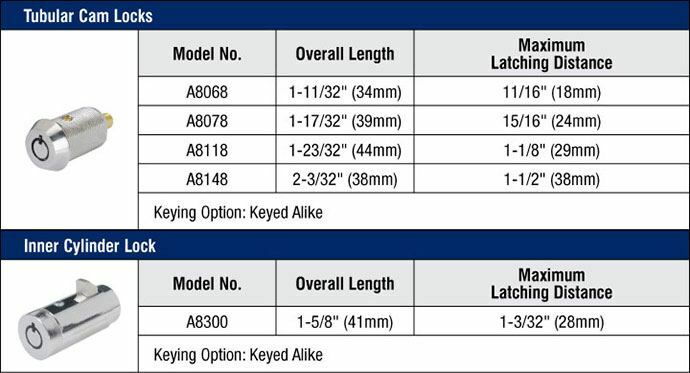 - Delivery: The American Lock A8148 Cam Locks are factory-ordered, please allow an estimated 3-4 weeks' lead time. Maximum Latching Distance: 1-1/2" (38mm). Keying: Choose between Keyed Different (KD) and Keyed Alike (KA). All A8148 Cam Locks come with 2 keys. Special Ordering: If you require the No. A8148 Cam Lock keyed to an existing key number please leave a note in the Comments Box upon checkout (you can also immediately reply to the Confirmation E-mail with special order instructions).